Nigeria signs bumper football partnership with Nike – Royal Times of Nigeria. The Nigeria Football Federation has renewed their equipment partnership with global sportswear manufacture Nike for the next four years, with an option for another four. 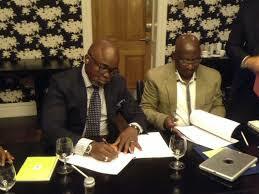 NFF President Amaju Pinnick announced this today. The new contract could see the NFF committed to Nike until 2026, and comes in the wake of a successful partnership which saw the Super Eagles’ World Cup kit earn rave reviews across the world. Shehu Dikko, the NFF’s Vice President and head of marketing, said that the new deal is a massive improvement on the previous one, and included the women’s and youth teams as well. He said this new contract now encompasses not just supply of kit, but also base compensation, which was missing from the last contract. According to him, there are increased performance bonuses, and increased percentage royalties from sales of merchandise. Also, to avoid the situation that the federation had recently with clearing of products at the port which led to the women’s team travelling without kit, Nike will now take the responsibility to deliver equipment door to door anywhere the teams are.